National Anti-Slavery Standard was established in 1840 by the husband and wife team of Lydia and David Child, who both were affirmed abolitionists as well as recognized successful writers (Lydia Child was the author of the poem “over the river and through the woods”). Using the motto “Without Concealment–Without Compromise” the Standard sought to extend the rights of slaves across the country. It implied not only suffrage rights for colored males, but also advocated suffrage for women. With perhaps the exception of William Lloyd Garrison’s Liberator, also published by the Society, the Standard was the most influential voice for abolition leading up to the Civil War. 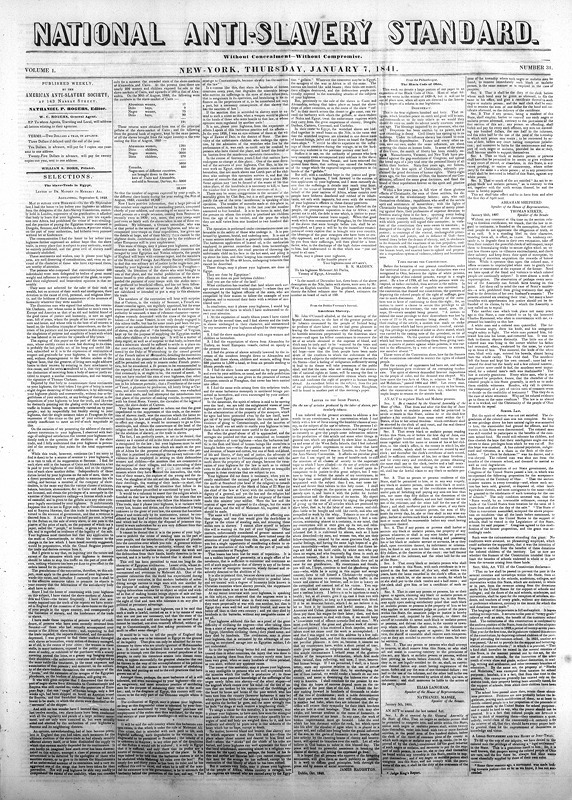 A weekly newspaper published concurrently in New York City and Philadelphia (1854–1865), and begun during a time when the American Anti-Slavery Society was torn over tactics of how to go about emancipation, National Anti-Slavery Standard featured writings from influential abolitionists fighting for suffrage, equality and most of all, emancipation. It contained essays, debates, speeches, events, reports and anything else deemed newsworthy in relation to the question of slavery in the United States and other parts of the world. Its audience was the members of the Society and abolitionists in the north. Its two key focuses in the elimination of slavery were on politics and religion, which considered slavery an evil institution. Although it asserted that God was the only being that could end slavery, it also recognized the value of political action. While the Standard was small by today’s modern measures — four pages containing only six columns — its personal accounts of slavery helped express the feelings and moods surrounding the controversy for thirty years. During its publishing life National Anti-Slavery Standard had various editors: N.P. Rogers, 1840–1841; Lydia M. Child, 1841–1843; D.L. Child, 1843–1844; S.H. Gay, 1844–1854; Oliver Johnson, 1863–1865; A.M. Powell, 1866–1870. One, Lydia Maria Child, edited and supplied the preface for a book entitled Incidents in the Life of a Slave Girl, by a former slave, Harriet Jacobs, under the pseudonym, Linda Brent, written for northerners to reveal the horrors and tragedies that enslaved colored people had to face. The events depicted in the book helped to highlight the impact of the Fugitive Slave Act and its effects on people in the north as well as the south. A letter from the author, “Linda Brent,” was published in the paper to stress the validity of her non-fiction novel. This gave the paper a literary flare that appealed to educated readers. National Anti-Slavery Standard continued to contribute to the fight against slavery in the United States, past the issuing of the Emancipation Proclamation, until ratification of the Fifteenth Amendment to the United States Constitution on February 15, 1870 effectively granted African Americans the right to vote. The final issue was dated April 16, 1870 although the paper continued to publish for an additional two years under a variety of short-lived names. Why don’t he do it?